I have a soft spot for a good taco salad. While maintaining a sheen of healthfulness, they boast representation from all five major food groups. You can get them with fatty meat, softened beans, all kinds of salsa, avocado... With all that going on, I'll never understand why some people think they need dressing, to boot. Anecdotally, I don't remember taco salads existing prior to the early aughts. But when they appeared in my college cantina circa 2004, they were an instant campus sensation. You could get a huge flour tortilla, molded into the shape of a bowl, fried to a brittle crisp, loaded with romaine lettuce, and topped with all manner of Tex-Mex goodness and a zigzag of that creepy, amazing, squirtable sour cream. As the semester wore down — and student meal plan dollars dwindled — adding a fresh-mashed scoop of guacamole ($2 extra) was a kind of status symbol. The children of 1 percenters, with their generous cafeteria flex-spending accounts, got the scoop. The rest of us suffered through taco salads minus the creamy avocado bump. Nowadays, I eat them less often. 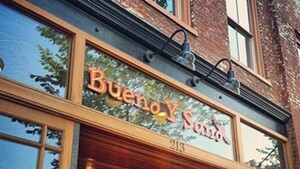 But, last week, a craving led me to a "grilled salad" at Bueno Y Sano's newish location on Dorset Street in South Burlington. Thankfully, food culture seems to have graduated beyond the crispy tortilla bowl. 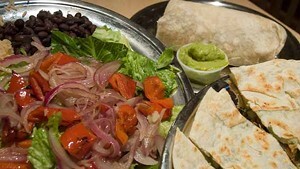 While I still see one from time to time, Bueno Y Sano's salad arrived spilling over the edges of a red plate. 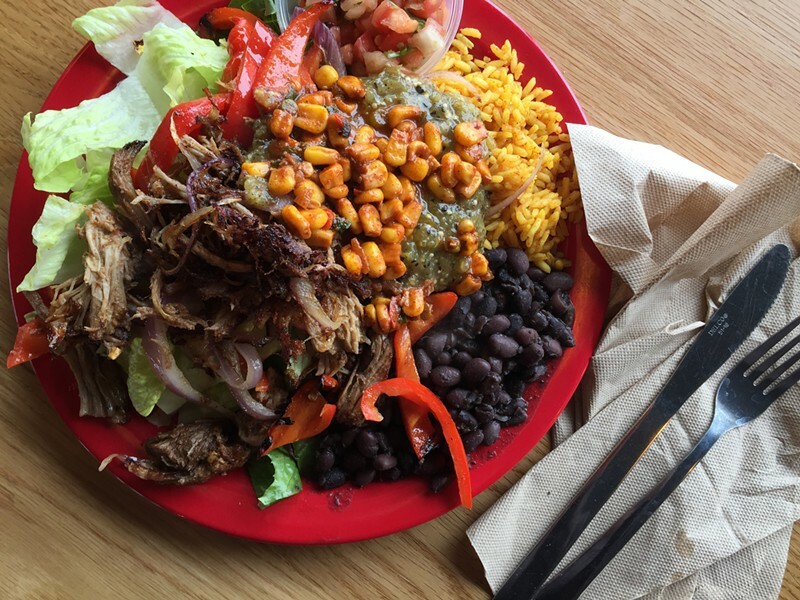 The lettuce was barely visible beneath an arrangement of seared red peppers and onions, stewy pork carnitas, black beans, Spanish rice, pico de gallo and the several salsas (tomatillo, corn and hot-hot) that I dumped on at the salsa bar. The price: $9.25, for a plate that might have made a meal for two, if neither sharing party was super hungry. I tend to keep my expectations for good Mexican food in check here in Vermont— gringo-Mex or otherwise. But the romaine was crunchy, the beans just salty enough, the meat well seasoned, and the veggies grilled sweet and supple. And the hot salsa? Searing and awesome. One thing about taco salads: The leftovers don't travel well. Which is a fine excuse, if you need one, to eat the whole thing.